Louise Bourgeois (1911-2010) was one of the most fearless and compelling artists of the 20th and early 21st century. For the last 28 years of her creative life, she worked almost daily with her assistant Jerry Gorovoy to realise her remarkable artworks. Don’t miss this rare chance to hear from Gorovoy, now president of Louise Bourgeois’ Easton Foundation in New York and Philip Larratt-Smith, editor of the forthcoming publication of Bourgeois psychoanalytic writings and curator of Louise Bourgeois / The Eternal Thread at the Long Museum Shanghai. Together they will discuss Louise’s life, her artistic legacy, her compelling writing, and her unique working relationships. Jerry Gorovoy and Philip Larratt-Smith are in conversation with Justin Paton, Art Gallery of New South Wales head curator of international art. 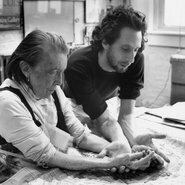 Image: Louise Bourgeois and her assistant Jerry Gorovoy, in her Brooklyn studio preparing to make a mould for a sculpture in 1995.